I started to hunt a chiropractic clinic last year while I had been suffering from my back and neck pain for 4 months though I kept on seeing doctors regularly. I tried rehabilitation and acupunctual therapy but both did not really work well on my complaints. There were so many clinics in this area and I really did not know which one to choose. It was just a happening for me to browse a small clinic's PR where Dr. Ito was there. It was my first visit over there. He listened to my past history and complaints patiently and then he explained to me about my physical condition preciously with the help of PC in English version. Maybe he knew that my japanese was not so good. (he he!) Afterwards, he did a chitopractic treatment on me. It was an amazing moment while I could have been feeling my good flow of the blood circulation inside my body, especially around my neck area after a treatment taken by Dr. Ito. I felt instantly better. At the end of the visit, I was also given an advice on my posture. After several visits, my sufferings had totally been relieved. Hurray! I was so happy I could have been back to my normal daily life! I was pleased I could have enjoyed my gymnasium leisure again. 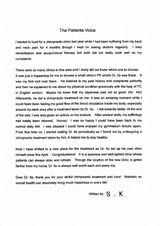 From that time on, I started visiting Dr. Ito periodically as I found out by undergoing a chiropractic treatment taken by him, it helped me to stay healthy. 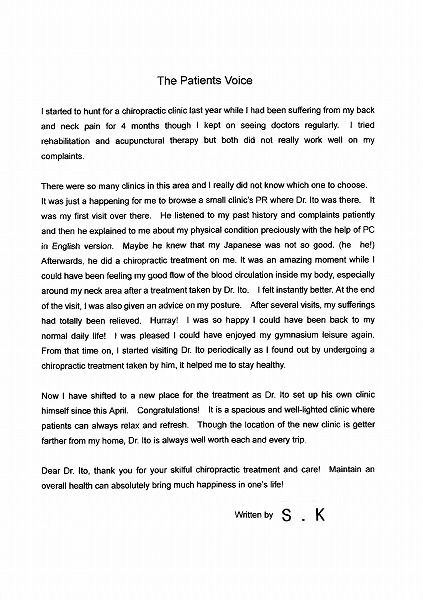 Dear Dr. Ito, thank you for your skillful chiropractic treatment and care! Maintain an overall health can absolutely bring much happiness in one's life! Copyright © 2019 整体 日暮里カイロプラクティックセンター All Rights Reserved.